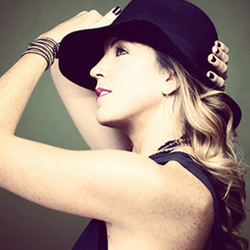 Kristin Sudeikis - DWDE LTD.
﻿Kristin Sudeikis A choreographer, dancer, teacher, and producer, Kristin Sudeikis is a highly influential member of the dance community. As Artistic Director of Kristin Sudeikis Dance and as a commercial choreographer, Kristin creates work that is rooted in igniting social activism. Kristin's commercial work ranges from screen to brand promotion, most notably the NIKE Blast women’s training event in Stockholm. Kristin and her choreography have also been featured on NBC’s30 Rock; with Mariah Carey on Good Morning America; in music videos and on tour; and in such publications as Marie Claire, Dance Teacher Magazine, and SHAPE. Most recently, Kristin choreographed music videos for Chinese pop star Bibi Wu, expanding her cliental of recording artists to include international musicians. Kristin has also produced and choreographed four original, sold out productions in NYC. Her 2010, Even in Silence… and Even in Silence part deux, the light Remains… explore the poignancy of the unsaid, and in 2012, Sudeikis created the world premier work, I Am You for the Peridance Contemporary Company. With social activism as a constant influence, Kristin choreographed and produced STAND, a benefit to promote awareness about human trafficking. Kristin Sudeikis Dance has also performed in festivals in NYC and throughout the United States. The company made its film premier in 2014, with an original dance film set to John Legend’s, “Made to Love”, and is currently creating their second series of dance films. When at home in New York City, Kristin teaches at Broadway Dance Center. She also travels nationally and internationally, choreographing, performing, and presenting master classes. This year, Kristin also represented Women in Dance, a mentorship program for emerging choreographers. Kristin’s driving focus is always to allow others to experience the social impact that is created when music, time, space, and ‘the other’ connect.